The Fellowship: What Can Men Do Against Such Reckless Hate? In my last post, I detailed how I orchestrated my first victory over the spiders of Mirkwood. My spirits were flying pretty high. I beat the first scenario a few more times in order to get a feel for the game a bit more before upping the ante and beginning my Journey Down the Anduin. Nothing will dampen your spirits like trolls. Here is the welcome mat. This seems like baptism by fire after the first scenario. (Though, as I admitted earlier, that was no cake walk either.) Why is the Hill Troll such a bad thing to encounter so early on? Well, let’s take a look at its stats. First, his encounter threat is 30. That’s not awful, but considering that most starting hero teams with decent stats weigh in at around that amount, you will likely have ol’ Hilly breathing down your neck sooner rather than later. His threat strength of 1 is the best part about this card. In other words, Hilly isn’t so bad if he sits around in the staging area. But–hoo boy–attack strength of 6? And defense of 3 with 9 hit points? This guy can do some serious damage if given the chance, and he’ll make it hard for you to do the same. And the usual red shirt strategy of sacrificing wimpy allies to the powerful enemy? Not a great plan with the hill troll’s ability: “Excess combat damage dealt by Hill Troll must be assigned as an increase to your threat.” ?! And that’s just the guy who’s blocking the way at the beginning. 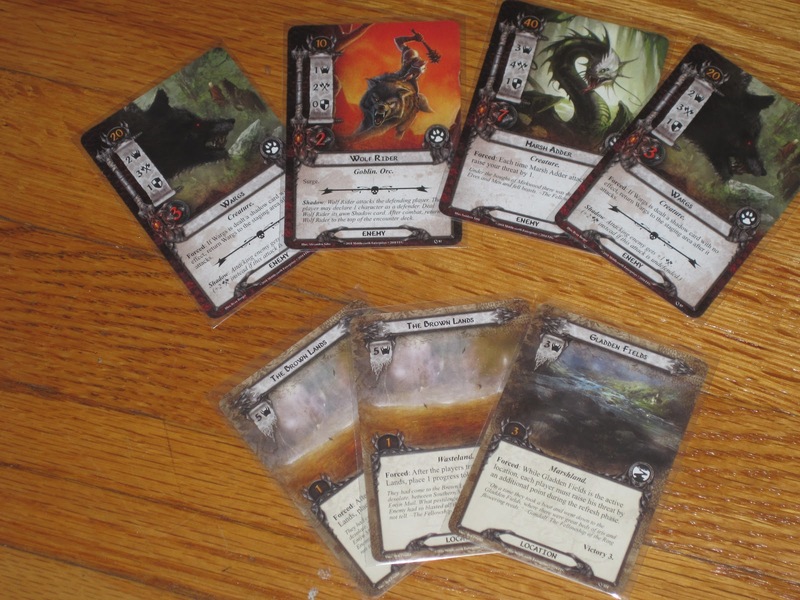 The rest of the encounter deck shows that this will be no lazy, Wind in the Willows trip down the river. There are Misty Mountain Goblins, who gobble your progress tokens, along with treacheries that do the same. Lots and lots of high threat strength locations. Lots of wolves and wargs and other nasty things that like to attack from nowhere and sit out of reach in the staging area. Oh, and did I mention? There’s another Hill Troll in the deck. I detailed before that I first attempted the Passage through Mirkwood scenario with the Tactics sphere, which was a mistake. However, a giant Hill Troll is the first thing I see in Journey Down the Anduin. What better to face such a large enemy than military might? Some of the other nasties you’ll face. At this point, I had constructed two decks. Looking at the basics of which spheres are good at which things, I constructed two decks: Tactics/Lore and Leadership/Spirit. I thought my Tactics/Lore deck stood the best chance against what the scenario could throw against it, and I chose Legolas, Gimli, and Glorfindel as my heroes to lead me into battle. Each of them has an attack of 3, which comes in handy against a giant troll. I was leery of their starting threat of 32–the troll will engage on turn 1–but I thought I’d have a better chance of defeating the troll sooner with high-attack enemies. This strategy did not pan out. My starting hand had a low-cost Tactics ally, so I put him into play. 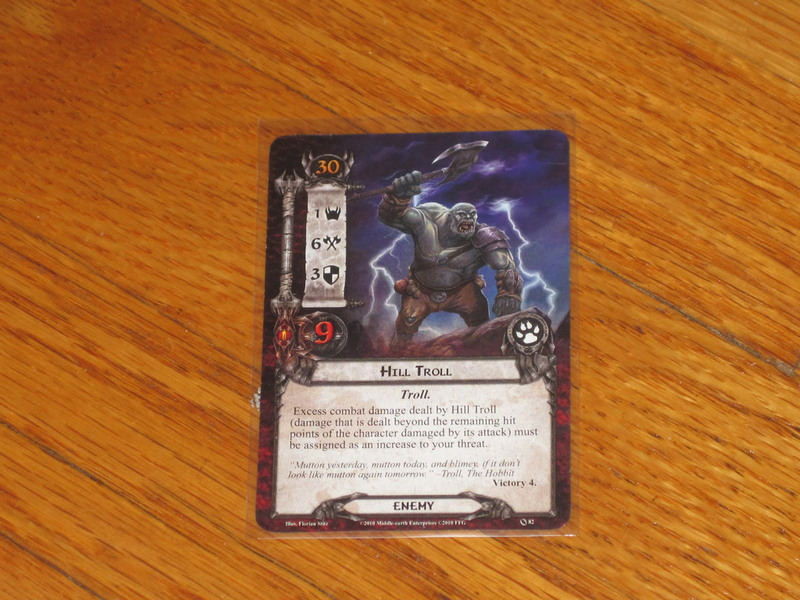 The first revealed encounter card was another enemy with another threat level set to engage me. I used Glorfindel to quest (it’s hard not to: he has 3 willpower! ), which meant I had to use two of my remaining three cards to defend. I foolishly used Gimli to defend against the weaker threat (Gimli gains +1 attack for each damage he suffers) and the red shirt against the troll. My threat level took a huge beating, but I still had Legolas left to attack. Unfortunately, he couldn’t take out the second threat with one shot, so I still had two enemies engaged with me. Next turn I put another cheap ally out. I quested with Glorfindel and–lo and behold–another enemy was revealed, and again, it was able to engage me (especially with my raised threat). I think you get the picture: I was locked in an unsustainable cycle of playing a cheap ally, more enemies entering my engagement queue, and not being able to manage my threat in the quests with just Glorfindel, yet not being able to commit more help because of all the enemies on my doorstep. The Hill Troll’s 6 attack could break through any defensive barrier, and I couldn’t play allies fast enough to satisfy his club, nor could I get many hits on since I needed more than 3 attack just to hit him. Needless to say, this was a loss: I didn’t defeat the troll. Next time I’ll detail my slightly better strategy…that also failed (while teaching me important things about the game). 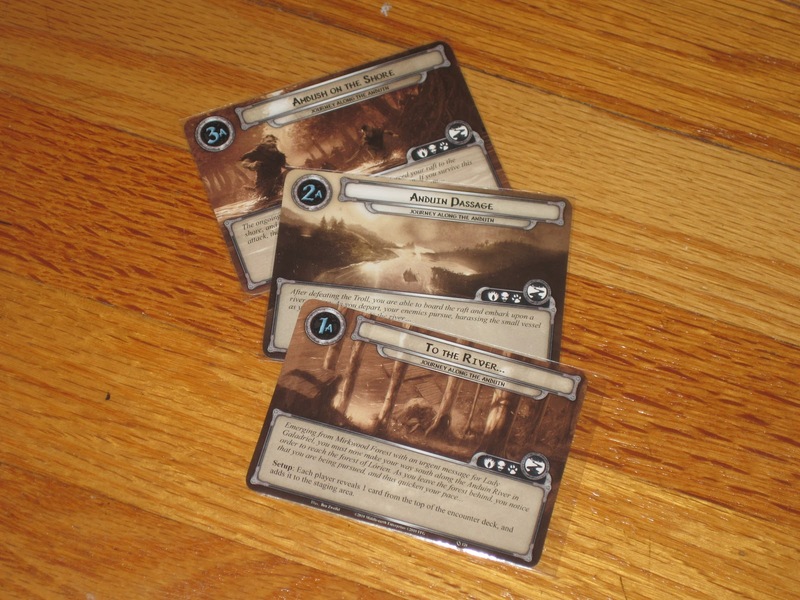 This post is part of a series detailing my journey through the Lord of the Rings card game. To see the other posts in this series, click “The Fellowship” tag below.